One of 3 portraits commissioned for the BBC Arts & Avalon Production of Katherine Parkinson's debut play Sitting, first performed as part of the Edinburgh Fringe Festival 2018 and touring to the Arcola Theatre, London in February 2019. 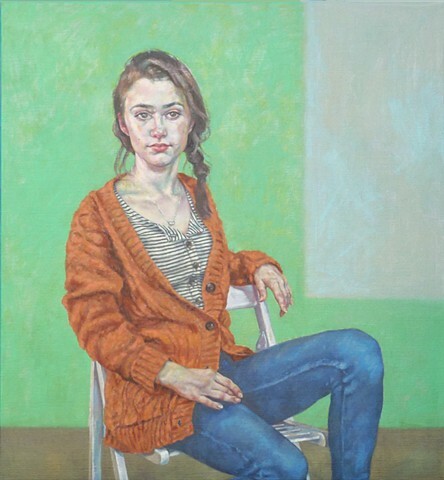 Grace Hogg-Robinson, the subject of this portrait, appears both as herself, an actor performing the role of Cassandra for the artist Roxana Halls and simultaneously as her character Cassandra, sitting for the fictitious artist John, the unseen painter at the center of the play. Grace's portrait was based upon Augustus John's The Orange Jacket in the Tate's collections which in part inspired the theme of the play. This portrait, alongside 2 others created especially for the play, are finally revealed in Sitting's final scene.